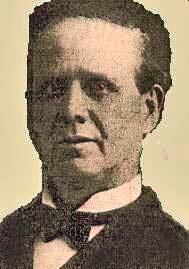 John B. Daisley came from Scotland to America in 1870 when he was about 21 years old. It is possible that he attended Bethany College in West Virginia. Ten years after arriving in the U. S., we find him preaching in North-central Pennsylvania. He left for the great west in 1886. Mr. Daisley was a persuasive speaker, presenting the claims of Jesus as Lord and getting public results. One writer says 80 were added during his first nine months in Washington Territory. Then another 88 were added before he and Margrete settled at Dayton and Milton. Mr. Daisley was not a newcomer to church leadership when he arrived. We can find "Elder Daisley" performing marriages in Pennsylvania as late as 1883. And these are just the ones with records that have survived. Assigning dates to Mr. Daisley's travels in the Northwest is difficult because he was some places only a few weeks or a month or two before moving on. Documentation for Mr. Daisley is sparse. The best insight we have now of John Daisley is from a report that he made to the Christian Standard in December of 1887. The report itself was dated November 21st. Permit me to make a brief statement for the benefit of my brethren in Pennsylvania who have been inquiring about this country and the condition of our missionary work. The climate here is very fine. Everyone here admires it for its pure and invigorating air. Our winters here are very short and not so severe as in Pennsylvania. The soil here is very rich and productive in raising all kinds of fruits and vegetables. There is no government land within eighty miles of Dayton, but there is (sic) plenty of lots and farms, or ranches as they are called in this country, that can be bought for a reasonable price, and which can make pleasant and confortable homes. Our missionary work is hard and trying, because of the unsettled minds of the people; therefore, it requires grit, grace and the pure gospel on the part of the evangelist to get the people to listen and think of the things which belong to their souls' salvation. Our evangelists have done exceedingly well in this direction. Bro. Dean, of Cheney, reports of several churches organized and are doing well. My own work reports one in Dayton, Dixie, Milton, and Pomeroy. Surely this ought to teach the brotherhood to be more earnest and active in responding to the call of the G. ? M. C.. our home mission, in order that more evangelists may be sustained in the field. Pomeroy is a beautiful town of about one thousand inhabitants, twenty-five miles east of Dayton. I delivered there twenty-two discourses in the M. E. Church, embracing the principles of our plea, which had a grand effect in removing prejudice and wrong thinking regarding the teaching of our people. The Methodist minister favored us with his presence, and heard for himself the ground of our faith and practice, which no doubt met his approbation, judging by the warm, and we trust sincere, prayer he offered on our behalf as follows: "O God, bless the people who take the Holy Bible and profess it to their hearts and who have covenanted with thee and one another to love thee and keep thy commandments, and may the time come when all parties and sects shall be done away," etc. To which many of the brethren responded with a hearty Amen. The meeting was regarded a grand success, which resulted in 7 baptism, 8 from other churches and 28 of our own brethren, and with them they covenanted with Christ and one another to stand on Bible ground, to keep the unity of the faith in the bond of of peace, and thus endeavor to promulgate primitive Christianity in Pomeroy. In order to do this the brethren saw the necessity of erecting a church house, and I am glad to say that the subscription papers are now at work to effect this end, thus fulfilling the prayers of Father Hastings and Bro. Thompson, two true, good and devoted disciples of Christ who have labored long to see the work accomplished in Pomeroy, the former having spend the best years of his life in preaching the gospel in destitute places without any remuneration, and who is now so feeble that his failing health won't permit his now to do such work, but he can be of great service with Bro. Thompson in teaching and taking the oversight of the congregation. May the brethren learn to love him for his work's sake. I now tender my thanks to Bro. and Sister Thompson and family for their kindness, not only in giving me a comfortable home with them, but for their hard work in the interest and success of the meeting. Next Lord's day our church house in Milton will be dedicated. Bro. Cheetham, of Centerville, formerly of Waitsburg, will deliver the dedicatory address. The church now numbers about eighty members. The church in Dayton is in fine working order. The prayer-meetings are well attended, which manifests the spiritual growth of the church. In my year's labor 24 were added to the congregation and now have entered upon another year's work with the full consent and good will of the entire congregation. "Mrs. J. B. Daisley was badly hurt as a result of a runaway Saturday afternoon in Pomeroy, Washington. Mrs. Daisley and her son, Harry, were in the back at the time the team became frightened. The horses ran down Second street to Columbia street where Mrs. Daisley and Harry were pitched out as the rig went over the railroad track. The young man was unhurt, but Mrs. Daisley sustained some severe bruises. Mrs. Daisley is well known to many Athena people, her husband having been pastor of the Christian church here." Historian John Brown says that John Daisley was still living in Oregon in 1904, but that appears to be incorrect because he is listed in both the 1900 and 1910 census at Pomeroy, Washington. His daughter Mary A. married Harry Benton of Colfax, Washington. Another daughter, Marguerite, married Edwin F. Beaudreau, a 1901 graduate of present day Northwest Christian College. This is the same year that Harry Benton graduated.